Template class CVector < class CType > This template class is a simple vector class allowing standard C-style and fortran style access to the elements. It also supplies an ostream operator. Definition at line 41 of file COptMethod.h. Definition at line 231 of file CVector.h. Definition at line 241 of file CVector.h. Definition at line 250 of file CVector.h. Definition at line 360 of file CVector.h. 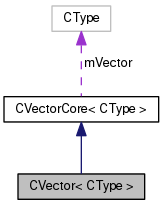 Referenced by CVector< CProcessReportItem * >::CVector(), CVector< CProcessReportItem * >::operator=(), and CVector< CProcessReportItem * >::resize(). Definition at line 261 of file CVector.h. Definition at line 273 of file CVector.h. Definition at line 284 of file CVector.h. Definition at line 301 of file CVector.h. 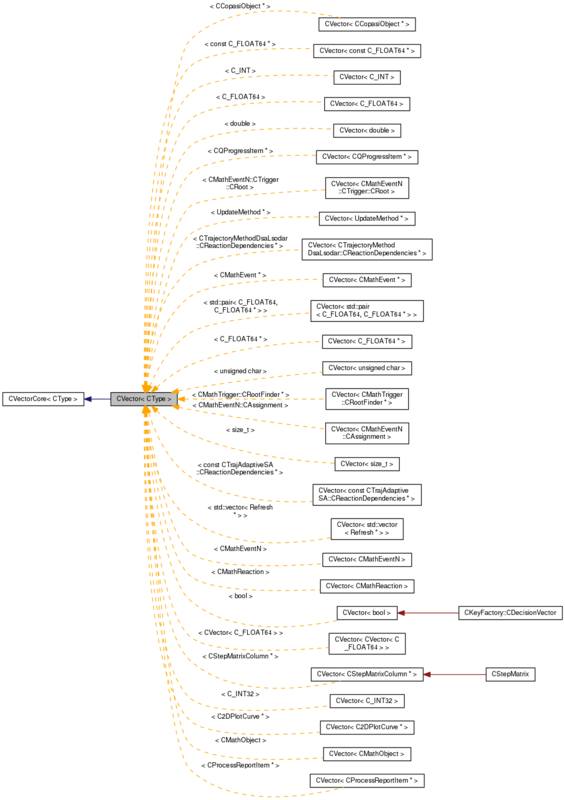 Referenced by CProcessReport::addItem(), CMathContainer::allocate(), CHistoCurveData::boundingRect(), CLinkMatrix::build(), CSSAMethod::buildExtremeCurrents(), CModel::buildStoi(), CModel::buildUserOrder(), CEigen::calcEigenValues(), CLNAMethod::calculateCovarianceMatrixReduced(), CTSSAMethod::calculateDerivatives(), CTSSAMethod::calculateDerivativesX(), CBitPatternMethod::CalculateKernel(), CBitPatternTreeMethod::CalculateKernel(), CMathModel::calculateRootDerivatives(), CExperimentSet::calculateStatistics(), CFitProblem::calculateStatistics(), COptProblem::calculateStatistics(), CExperiment::calculateStatistics(), CMCAMethod::calculateUnscaledConcentrationCC(), CFluxScore::CFluxScore(), CMCAMethod::checkSummationTheorems(), CTimeSeries::clear(), COptMethodSS::combination(), CMathModel::compile(), CTimeSeries::compile(), CExperimentSet::compile(), CExperiment::compile(), CExperimentObjectMap::compile(), CLinkMatrix::completePivotInformation(), CMathReaction::copy(), CVector< CProcessReportItem * >::copy(), CLsodaMethod::createRootMask(), CCSPMethod::CSPImportanceIndex(), CCSPMethod::CSPParticipationIndex(), CCSPMethod::cspstep(), CVector< CProcessReportItem * >::CVector(), CLsodaMethod::destroyRootMask(), CMathModel::determineInitialRoots(), CILDMMethod::deuflhard(), CILDMModifiedMethod::deuflhard_metab(), CStepMatrixColumn::getAllUnsetBitIndexes(), CStepMatrix::getUnsetBitIndexes(), CMathContainer::init(), CExperiment::initExtendedTimeSeries(), CopasiPlot::initFromSpec(), CMathReaction::initialize(), COptMethodEP::initialize(), COptMethodSteepestDescent::initialize(), COptMethodStatistics::initialize(), CRandomSearch::initialize(), COptMethodDE::initialize(), COptMethodSRES::initialize(), COptMethodPS::initialize(), COptMethodGA::initialize(), COptMethodGASR::initialize(), COptMethodHookeJeeves::initialize(), COptMethodLevenbergMarquardt::initialize(), COptMethodNelderMead::initialize(), COptMethodSA::initialize(), COptMethodCoranaWalk::initialize(), COptMethodPraxis::initialize(), COptMethodTruncatedNewton::initialize(), CFitProblem::initialize(), COptProblem::initialize(), CLyapTask::initialize(), COptMethodSS::initialize(), CNewtonMethod::initialize(), CProcessQueue::initialize(), CEigen::initialize(), CTSSAMethod::initializeAtol(), CModel::initializeAtolVector(), CHybridMethodODE45::initMethod(), CHybridMethodLSODA::initMethod(), CLyapTask::initObjects(), CTSSAMethod::integrationMethodStart(), LUfactor(), CTSSAMethod::mat_anal_fast_space_thomas(), CTSSAMethod::mat_anal_metab(), CTSSAMethod::mat_anal_mod(), CILDMMethod::newton(), CILDMModifiedMethod::newton_for_timestep(), CILDMModifiedMethod::newton_new(), COptMethodLevenbergMarquardt::optimise(), COptMethodEP2::optimise(), partialSortWithPivot(), CExperiment::read(), CTSSAMethod::schur(), CTSSAMethod::schur_desc(), CFitProblem::setResidualsRequired(), CHybridMethodODE45::setupReactionFlags(), CStateTemplate::setUserOrder(), CProgressBar::slotAddItem(), CNewtonMethod::solveJacobianXeqB(), sortWithPivot(), CILDMMethod::start(), CILDMModifiedMethod::start(), CTauLeapMethod::start(), CStochDirectMethod::start(), CCSPMethod::start(), CLyapWolfMethod::start(), CTrajAdaptiveSA::start(), CLsodaMethod::start(), CTrajectoryMethodDsaLsodar::start(), CILDMMethod::step(), CILDMModifiedMethod::step(), CTSSAMethod::sylvester(), and CCSPMethod::yCorrection().